The Catalan Youth Culinary Contest, held in Sant Pol de Mar, Barcelona, at EUHT StPOL hospitality school since 1987 focused this year on micro-vegetables. 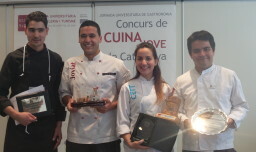 Ana Laura Vera Grimaldos was selected as the winner of the competition by a jury chaired by chef Albert Adrià. Director of IGCAT, Dr. Diane Dodd formed part of the panel judging the dishes.